During the 1860s Fr Boyle, a priest at St John’s, decided it was time for a grand instrument to be installed. It is recorded that an order for a new instrument was placed with the famous London firm of William Hill & Son in York Way, Islington. 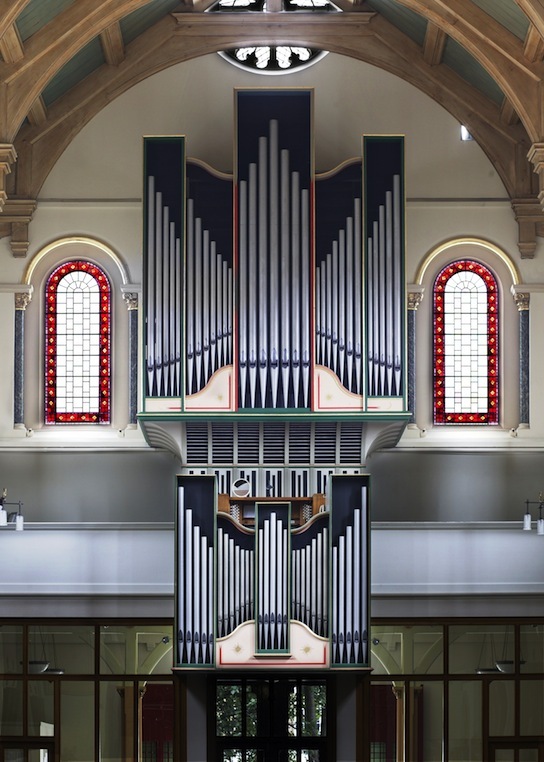 Their most famous organ is the one still playing at Sydney Town Hall in Australia, containing some of the largest and longest pipes in the world, some being 64’ feet long. The Islington organ was placed in a chapel towards the front of the church, but then something rather unusual happened. According to the church archives, Cardinal Wiseman appointed Canon Frederick Oakley as Parish Priest to St John’s. Oakley, being a convert to Catholicism, found that some parishioners were unhappy with this arrangement - including Fr Boyle, and a dispute ensued between Fr Boyle and Wiseman over the appointment. The situation was hopeless, and Fr Boyle eventually left and moved to St Philip’s Church, Arundel, Sussex (then a new church, completed in 1873). 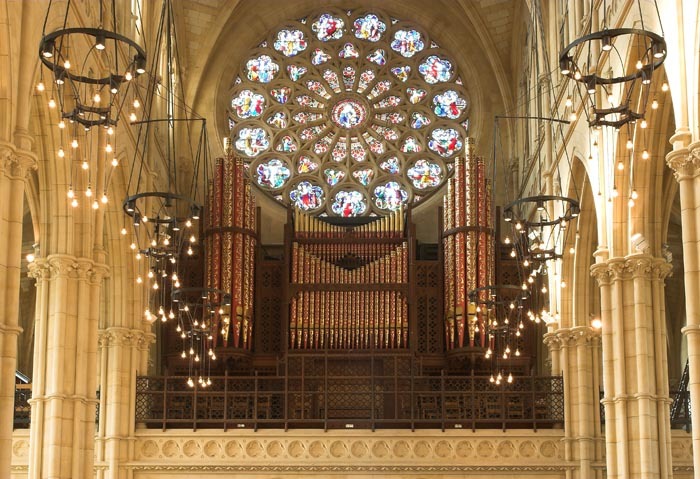 In the circumstances, Fr Boyle decided that his ‘gift’ of an organ would be better suited to Arundel, and once he was installed, had the organ built at Arundel (now Arundel Cathedral). Being a much larger building the organ was made bigger (see illustration). This instrument had a major restoration in 2006, and a fully documented history was recently published by Nicholas Plumley. At the opening of the church in 1843, an organ was hired (possibly the Hill instrument just mentioned, and placed in one of the chapels facing into the church, though the records regarding this are vague). 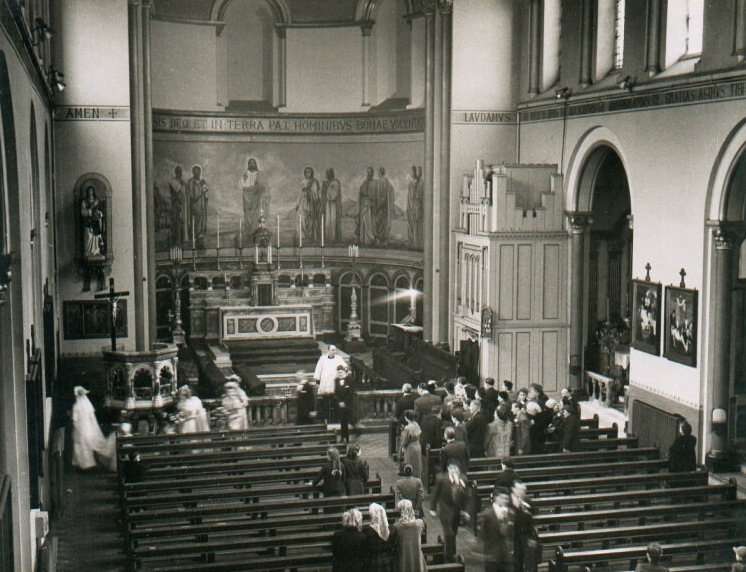 This temporary arrangement became a great financial burden on the parish, so it was decided to purchase an instrument which was placed to the right of the altar, where it remained until the early 1960s. The organ was built by J C Bishop & Son, a London firm still operating in Beethoven Street, near Paddington, and subsequently enlarged by Bishop, Starr and Richardson in the late 19th century (see picture). 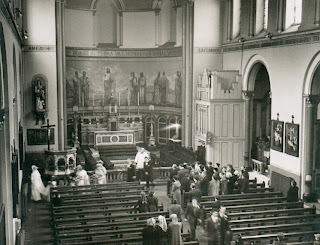 By the late 1950s the choir had expanded a great deal at St John’s and the choirmaster, Edward de Rivera, and organist Shaun McCarthy decided it was time a new, much more modern organ should be installed in the church to accompany the expanding choir - as well as for concerts performed in the church. The organ we see and hear today was built by J.W.Walker & Sons in 1963 when the firm were at Ruislip, and in consultation with Shaun McCarthy. Douglas Mews, then organist of St George’s RC Cathedral, Southwark, gave the opening recital on 13th February 1963. Some of you may not even be aware of the historical importance of the instrument we have in our church. If you prefer to attend other masses other than the Sunday 12noon Mass, then you might not have even heard the organ! During the week, it is used by many for rehearsals and teaching for the benefit of young students from various colleges in London and elsewhere. In the evening the church, which is fortunate in being situated in a quiet, residential area, has been favoured by many record companies as a recording venue. This organ from 1963 turned out to be one of the wisest purchases St John’s church has ever made. It was completely up-to-date for the time, and conceived in a style that had not been seen in this country before, but was found in Northern Europe, principally North Germany and the Netherlands. It differs from conventional British instruments in its tonal make-up and appearance. The Rückpositiv division, which hangs over the gallery and can be seen above as you enter the church, was unique for this country in 1963. This section of the organ was not to accompany the congregation but to solo-out lines of music. 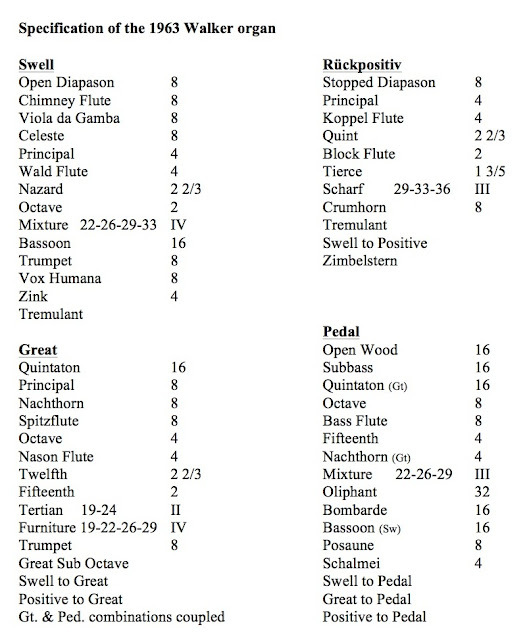 What in fact was produced was an eclectic-sounding organ which could adapt to many areas of the organ repertoire. The St John’s organ was the ‘talk of the town’ in the 1960s and many people came to hear and play it. The BBC regularly used it for recordings and live radio broadcasts until the 1970s, when suddenly it was decided to sell the organ because of outstanding debts from its initial installation. Because of the changing fashion of music in the church at the time, it was felt that an organ was no longer required! The Royal Academy of Music in Marylebone Road very nearly bought it for installation in its Duke’s Hall. The great change in mood, coupled with Vatican II (although this never stated that the traditional instrument of the church should be given a back seat) and the priest at the time, meant difficult times for the musical tradition of the church. Thankfully, pressure from various organ bodies that understood the organ’s importance as an instrument helped to save the day, and we now have it here to enjoy each week. 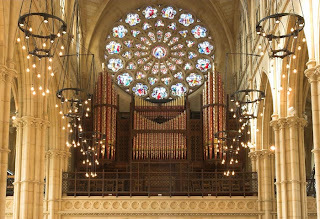 The contribution of J. W. Walker & Sons Ltd to the ‘organ reform movement’ (the new continental sound) can be said to have begun in 1952, when Ralph Downes had a new organ built at the London Oratory and designed the tonal scheme for the famous Royal Festival Hall organ built by Harrison & Harrison. Almost all ‘un-nicked’ pipes in the voicing process were used alongside French-style reeds that have a full-throttled brassy tone. A great deal of experimentation accompanied by trial and error was involved, but the end-effect was original, exciting and musical. This ‘neo-classical’ formula or rather ‘new classical’ style, fashionable in the mid-twentieth century, particularly in France and America, aimed at an ideal fusion of French reed and classical flue pipes. Walker’s produced a plethora of instruments in the 1960s that reflected this new ethos, and took on board new ideas brought about by this new organ reform movement (which had arrived in Britain some thirty years later than in other countries). New materials were available and used in the building process. Although not all of these proved long-lasting, the drive and vision of the Ruislip Walker firm was laudable. Major instruments from this firm, such as those at Liverpool Metropolitan Cathedral, Blackburn Cathedral, St Peter’s Clerkenwell, The London Oratory and St John the Evangelist are but a few of their large output. They were voiced by the epoch-making Dennis Thurlow. Others involved were Michael Broom, Michael Butler, Keith Bance and Arthur Jones. As mentioned earlier, St John’s was used by the BBC and recording companies in the 1960s and 70s. A memento of those times, a ‘BBC broadcast’ light, can still be found on the organ console. Recordings and broadcasts were given by (to name a few): Simon Preston, Nicolas Kynaston, Flor Peeters, Jane Parker-Smith, Dame Gillian Weir, Sir Nicholas Jackson, Alan Harverson, Graham Steed, Douglas Mews, Philip Moore, Ludwig Ultman, Carmel Dohoghe, George Malcolm, Christopher Bowers-Broadbent, Jeremy Filsell, The Vasari Singers, The London Oratory Choir, John McGreal, Adrian Gunning, Joanna Paul, Martin Stacey and Jennifer Bate. Through these recordings, organ- and music-lovers generally could grow accustomed to the sounds of the Organ Reform Movement or ‘continental’ sound in the comfort of their own homes. I have been in contact with the original builders of the instrument and asked them to send me details of the original purchase price and specification. I found that the initial cost of the organ in 1963 was £15,000. To replace our organ now with a similar-sized instrument would cost in the region of over three-quarters of a million pounds. So yes, a sound investment! It will hopefully continue to give good service for many years to come. The instrument was awarded a BIOS (British Institute of Organ Studies) certificate of historic importance in 2007; …. “in recognition of it being an important instrument by J W Walker in 1963 in a changing phase of British organ building and associated with eminent organists of the time”. Like all things with moving parts, renovations and repairs have to take place. An excellent example of its time with many years of service, the organ at St John’s needed a comprehensive renovation by the end of the 1990s. This began in 2005 when the organ was silenced after the Easter Mass. The renovations were a lengthy process, due mainly to the restoration work on the church’s fabric. Progress was also hampered by the discovery of asbestos around the RSJ beams supporting the organ. Keith Bance Organ Builders, who have looked after the organ for nearly twenty five years, worked throughout 2005 and 2006 and the project took a year to complete, with the opening of the restored organ taking place on Saturday 24th June 2006 in a concert given by arguably the greatest recitalist in this country, Dame Gillian Weir. We were very honoured to have her give this important opening concert to a full church. In 2011, a generous donation meant we could proceed with updating the electrical wiring and stop mechanisms in the console where the organ is played from its three keyboards, pedals and 46 stops. The organ at St John the Evangelist, Islington, celebrates its 50th anniversary of installation with a series of celebrity concerts. The first of these on May 25th is to be given by Douglas Mews (son of Douglas Mews (1918-1993) who inaugurated the organ in February 1963).